A Day Late and A Dollar Short: Old Navy Friends & Family Event This Weekend - 30% Printable Coupon! 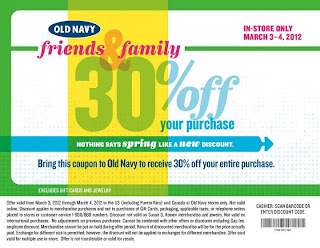 Old Navy Friends & Family Event This Weekend - 30% Printable Coupon! It's Old Navy's friends & family weekend. Visit the Old Navy facebook page and you can print out this 30% coupon. *Coupon is valid through 3/4/12.